The operations within the pre-sale condo market in Greater Vancouver are rather murky, and obtaining reliable data can be tricky. However, a recent report from MLA Canada, a company whom works closely in the marketing of pre sale condo developments, shed some light on the rather secretive sector of the housing market. 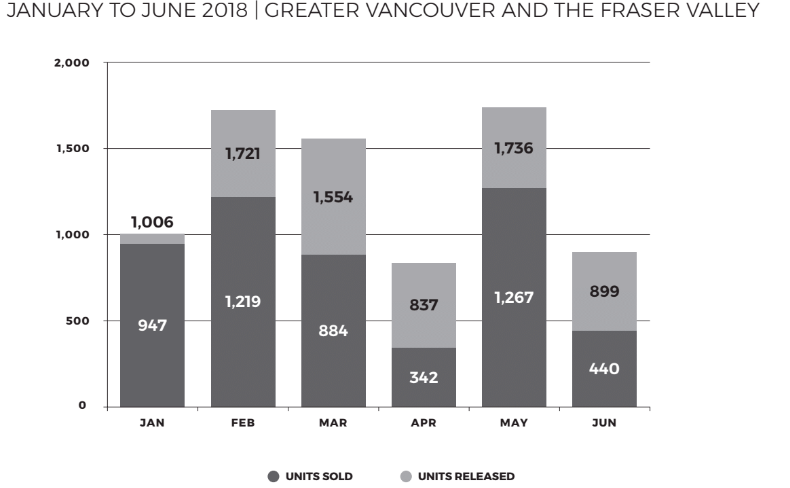 Over the course of 2018, MLA Advisory has been tracking pre-sale inventory releases and same month sales rates to assess current demand versus incoming supply, as well as buyer urgency in Greater Vancouver and the Fraser Valley’s housing market. 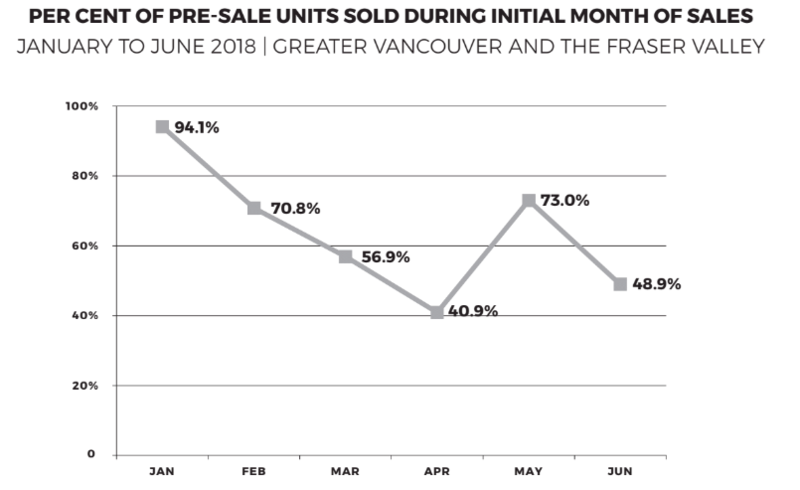 Much like the resale market, where Vancouver condo sales are hovering near five year lows, demand peaked in early 2018 and has been sliding ever since. The absorption rate for pre-sales dipped down to 48.9% in June 2018. While the trend is certainly unwelcoming news for condo developers, the current absorption rate is nothing to panic about, not yet at least. What could trigger a cold sweat are current market trends continuing at a time when housing starts sit at record highs. New developments are also competing with a slowing re sale market which is witnessing prices cool and inventory grow, up 45% in June. This has triggered a growing chorus of Realtor bonuses and decorating incentives to prospective buyers. To think it was just 12 months ago when buyers were camping out-front sales centres.